We are one of the leading manufacturers & suppliers of under frames for bogies in the eastern part of India. These are of different specifications & Re desiged as per the requirements of the customers. They are made using high grade materials which makes them highly durable. 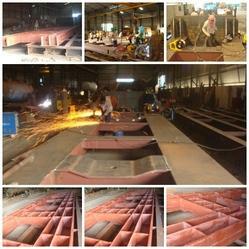 We offer Machined Bogie Frame, which is made up of very high grade raw material. It is designed as per railways drawings & specifications. Our experts allow us to meet the bulk and immediate requirements of our clients. We always make sure that only quality tested Machined Bogie Frame are delivered at client end. FLEXX Power bogies The FLEXX Power bogie portfolio serves the complete range of locomotives: from freight and heavy haul to passenger trains, as well as very high speed power heads.